---------------------------------------------------- Brasil Steak House. 12 different varieties of meat, and as much of it as you can eat. 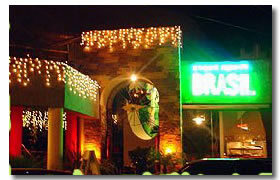 If you like your food barbequed you'll love the Brasil Steak House. They serve up an array of top quality meats all barbequed on the grill. Your taste buds are watering as soon as you walk in the steak house. You're worked up to your barbequed meat with an appetizer first. This is usually something like fried banana slices and some rice balls. I forgot to tell you about the best part of your meal, there are no menus here. They just bring you out food, and you eat as much of it as you can. You get a bit of everything they serve. After you finished your starters you get an assortment of salads brought out to you which include pasta. Then when you least expect it your meat is served up. But it's not the way any other restaurant would do it. They bring it out to you with a 3 foot sword through the middle of it. This sword holds twelve different kinds of meat. All the meats they cook at the restaurant are on here which is why you don't get a menu, you get everything anyway. You can eat as much as you like here, it's just one price to eat which is about $25 a head, and that doesn't include your drinks. You will be encouraged to eat as much as possible for your per head price. It's a good night out. They serve drinks as well which just adds to the fun. 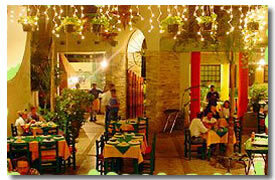 The Brasil Steak House is situated on Emiliano Zapata right in the center of downtown Cabo San Lucas. It's right in the heart of the Cabo nightlife.